Is something wrong with my engine? Did I not screw on my gas cap tight enough? Should I immediately take my car to be checked out? Is this just a bad sensor like last time? Automobiles today generate a great deal of information. Often times this information is nebulous in nature unless you are a mechanic. The spectrum of what the check engine light truly represents is so vast, it is often ignored by drivers, sometimes to great detriment. Furthermore, a data storage solution may in fact generate a multitude of information in the form of logs, alerts, and notifications. Without the trained ability to interpret them it can be like the engine light on your automobile dashboard in which uncertainty abounds. Nimble Storage has thousands of sensors within the operating system that collect data and send it to HPE InfoSight in the cloud. This built in intelligence actively monitors all facets of your data storage environment including your non-storage infrastructure. It sees across the infrastructure stack and resolves problems beyond storage. When an issue is uncovered, HPE InfoSight proactively resolves it if at all possible. Case in point: A company was experiencing high latency issues with their old storage solution. After three years of troubleshooting the issue with the vendor’s technical support staff, the company replaced it with a Nimble Storage solution. They did so under the assumption that the latency was attributed to the storage arrays or the drives themselves. Once deployed, the latency problem was resolved in less than a day thanks to sensor data correlation that ascribed the problem to a configuration error in a connected switch. The problem never was the storage unit itself. Of course, at some point, you may have to contact HPE Nimble support. Nimble takes much of the uncertainty out of that process and your call is picked up by Level 3 support, usually within one minute. We all know how important it is to keep your infrastructure appliances, devices, and components fully patched and updated. However, there is also a “hold your breath” mentality. With so many components involved in your data storage environment, it is difficult to predict the full interoperability amongst all of the moving parts. This does not apply to Nimble Storage however. InfoSight Predictive Analytics is constantly predicting and preventing problems before they can affect your operations. It is able to do this because it receives data from millions of sensors from all of their globally deployed systems every second of the day. HPE InfoSight then correlates that data, learns from it, and makes your system smarter and more reliable. This means there is no more uncertainty when updating firmware. Updates for the array OS that have known compatibility issues with your environment are blacklisted, preventing technical staff from implementing the update until the issue has been remediated. Eliminating uncertainty means more than vastly reducing the number of support hours that Internal IT may spend troubleshooting and fixing problems. 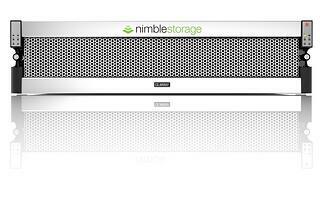 It translates into 99.9999% uptime and availability, which Nimble Storage guarantees to its customers. There is no reason to worry about infrastructure anymore as HPE InfoSight takes care of it. When will I reach full capacity and need more storage? Which applications are consuming the most storage? What is our current growth rate? Up to now, this type of forecasting has been guesswork. Unfortunately, future performance, continued reliability and budgeting processes have depended upon these guesses. With Nimble Storage and HPE InfoSight, there is no more guesswork. Now you have the information to accurately forecast future capacity, performance, and bandwidth needs. This degree of prescriptive guidance simplifies planning. InfoSight will even predict performance hotspots and provide guidance in how to avoid them. Unlike the check engine light in your automobile, you never have to “guess” what a triggered alert means. With the integration of Nimble Storage and HPE InfoSight, there is certainty in an uncertain world.